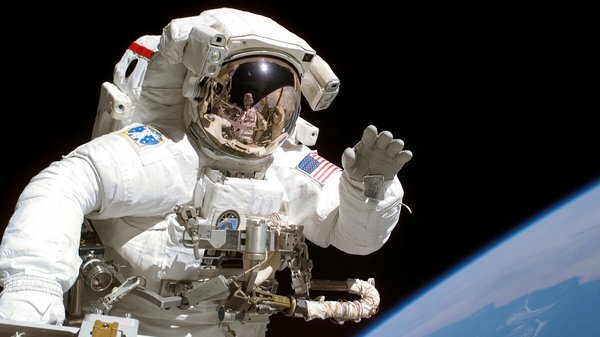 By Terry Dunn on March 30, 2016 at 9 a.m.
During my time working as a contractor for NASA, I was presented with several opportunities to wear an Extravehicular Mobility Unit. But getting into the suit wasn't all fun and games. 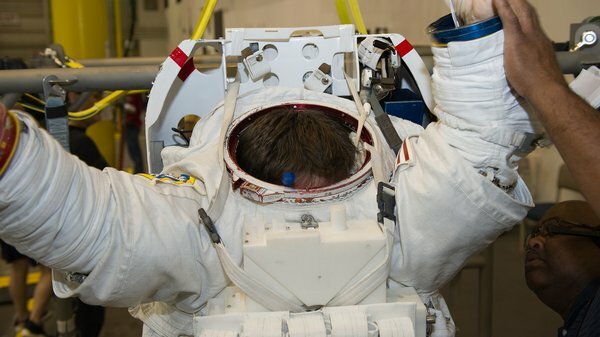 During my time working as a contractor for NASA, I was presented with several opportunities to wear an Extravehicular Mobility Unit (EMU), the suit that spacewalking astronauts have used since the beginning of the space shuttle program. While the majority of my experience as a suit-wearing "test subject" was exciting and enjoyable, it wasn't all fun and games. The EMU has a way of showcasing the humility of its occupants and I was no exception. When people ask me about my experience in the EMU, I usually tell them, "The only thing better than getting into an EMU is getting back out." It may sound cavalier, but it's the most efficient wording that reflects the love-hate relationship that I slowly developed with the suit. I never turned down a chance to wear the EMU in any capacity. I was often sleepless with excitement the night before. At the same time, I was never sad for those events to come to an end. All I wanted was to slither my body out of its puffy man-made cocoon and pop a few ibuprofen to ward off the aches and pains that often followed. The fun parts of being in the suit are pretty obvious. Who wouldn't jump at the chance to play junior astronaut? Those good parts always outweighed the bad. It took a while for many of the downsides to emerge, but some unexpected challenges just couldn't wait. This story reflects the beginning of my gradual awakening to the indignities, discomforts, and dangers that are inextricably linked to the fun and exhilaration of wearing an EMU. Rather than being a custom-tailored suit for each astronaut and test subject, the EMU is a modular system consisting of several components (legs, arms, etc. )…each available in a few different sizes. It is your specific combination of parts that makes the suit fitted to you. Nailing down the sizing for someone is a process that requires a minimum of three separate events. 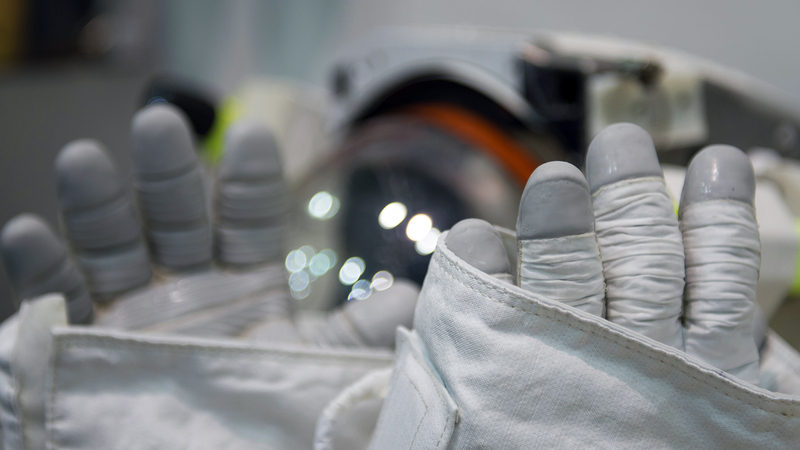 Some astronauts come back again and again during their career to address trouble spots or accommodate changes in their body. During the first sizing step, I had to stand partially naked while technicians compiled a long list of my body measurements. This data allowed engineers to take a preliminary stab at what components would fit me. A week or two after getting measured, I was allowed to try on a few different sets of gloves that had been picked out for me. Of all the different EMU components, the gloves have the largest variety of sizes to choose from. For these types of events, the gloves are attached to arm components within a vacuum box. The pressure difference afforded by the box provides the same feel as gloves attached to a pressurized suit, but with a much smaller overhead. Another week or so after choosing my favorite gloves, it was time to go all the way and put on the full EMU. I don't recall having any apprehension about this…just excitement. I had watched people get into and out of EMUs every day as part of my normal job duties. It was always a non-event for them, so why should I be any different? Things started off just fine. I was able to get into my Maximum Absorbency Garment (MAG – fancy name for a diaper…my first since toddlerhood), long johns, and Liquid Cooled Ventilation Garment (LCVG - think "fishnet jumpsuit") without any assistance. I then sat on the floor and was helped into the Lower Torso Assembly (pants with attached boots) by two technicians. The numerous layers of fabric made it a little tricky to get my heels properly positioned in the boots, but we got things squared away without too much fuss. The next step was for me to get into the Hard Upper Torso (HUT). This is a rigid fiberglass component that approximates a shirt--a really uncomfortable shirt. The HUT was mounted to a rig that held it at my chest height. All I had to do was squat beneath the bottom opening of the HUT, reach my arms up, and stand. As I stood, my arms would work their way through the side openings of the HUT and my head would crown through the neck opening. It sounds easy, and for some, it is. But things didn't work out that way for me. Like most people, my shoulders are a little wider than the elliptical opening in the bottom of the HUT. To get around this, you typically have to start your way up with one shoulder higher than the other. It's no big deal as long as you don't mind the constriction. I found that I had to slightly hyperextend my elbows in order to get my arms in through the bottom opening and then outward towards the arm openings. As I slowly rose into the HUT, the hyperextension peaked and then relaxed. Yes, it was a little uncomfortable, but it wasn't bad enough to make me tap out. As I slowly continued upward into the HUT, I soon discovered that my head wouldn't go through the neck opening. It felt as if the hole had been completely closed off. I squatted back down and poked my head out to glance around the room. I expected to find the supporting engineer and technicians snickering at my expense. "Ha ha, you short-sheeted the new guy. Good one." Only there was no snickering…only serious faces wondering why I had aborted my HUT donning attempt. My thighs were quivering with exhaustion and the backs of my arms were bruised from repeatedly squeezing through the tight bottom opening of the HUT. I told them what I had felt and they explained to me that this situation sometimes happens to first-timers. They gave me some tips and I tried again...and again. I don't remember how many times I unsuccessfully attempted to force my way into the HUT before my thighs were quivering with exhaustion and the backs of my arms were bruised from repeatedly squeezing through the tight bottom opening. No matter what I tried, my head refused to go through the top opening. I was at a dead end. The engineer wisely suggested that I sit down for a minute to catch my breath, wipe the sweat from my brow and take a drink of water. It was a welcome respite from the physical effort and mounting frustration, but I knew that a pivotal moment was approaching. If I didn't find a way into that HUT, and soon, my hopes of ever wearing the suit would be dashed. I decided that my next attempt would be all or nothing. I would ignore every discomfort and spare no effort. I soon found myself crouched once again below my fiberglass tormentor. I reached my hands up through the bottom of the HUT to get a preliminary grip on the suit arms. As I slowly raised my body upward, I tried to remember all the advice I had been given. My scalp hit the now-familiar obstruction. I reminded myself, "Chin up, head turned slightly" and then I could feel progress. Just as my head began to emerge through the neck ring, my raised triceps became wedged between the sides of the HUT. Rocking my torso back and forth freed the logjam. Steady force from my legs kept me moving slowly upward. My nose eventually cleared the opening and I could breathe the fresh, cool air of the room. With one last push, my chin emerged from the neck ring and I was standing upright…sweaty and tired, but fully inside of the HUT. Finally getting all the way into the HUT was a double-edged sword for me. There was no question that I was relieved to have forced my way in. Yet, the necessary effort and the continued tight fit soon caused me to have serious doubts about my ability to ever get back out. I actually wondered if they would have to saw open the HUT to extract me…not that anything like that has ever happened. I've never been prone to claustrophobia or panic attacks. Yet, in that moment, I was as close as I've even come to experiencing both maladies. The best thing about being in the HUT was that the technicians could then connect my LCVG to the system that pumped chilled water through the garment's myriad tubes. The cooling effect of the water was immediate and very much appreciated. I still felt anxious, but I slowly got my heartrate and breathing closer to normal levels. The fit-check was far from over. I still had to don the gloves and helmet, not to mention all of the steps for evaluating how every component of the suit fit me. I don't remember if I talked about my extraction concerns with the support staff in the room, or maybe they just saw it on my face. Either way, there was a very big elephant in the room and nobody was going to benefit from ignoring it. After all of that effort expended getting into the HUT, and before any meaningful work had been done, I was told to get back out. With no small amount of apprehension, I lifted my arms and began to retrace my steps in an uncertain journey out of the HUT. I found that descending out required many of the same techniques as ascending in: head turned sideways, rock the shoulders, and tolerate the brief hyperextension. The big difference this time was that gravity was helping me. I was soon released from the HUT's grasp and sitting comfortably in a nearby chair. All of my anxiety evaporated as I relaxed in that chair. I had learned two truths that were very uncertain only minutes before: I could get into the HUT, and I could get back out. I soon slipped right back into the HUT without any trouble and the rest of the fit-check went off without a hitch. In fact, I never again had any issues donning or doffing any part of the EMU. Not that I ever relished the prospect of contorting myself into a HUT, but I didn't dread it either. The brief discomfort was a small price to pay for the ultra-unique perspectives that the suit provides. The EMU is best handled with patience and finesse rather than brute strength. My initial experience donning a HUT taught the first of many lessons that I would eventually learn in the EMU, sometimes receptively, but often stubbornly. Most of these lessons stuck to a common theme: The EMU is best handled with patience and finesse rather than brute strength. If wearing the suit was a sport, it would be more akin to curling than rugby. Throughout all of my events in the EMU, I had the luxury of my competency being irrelevant. 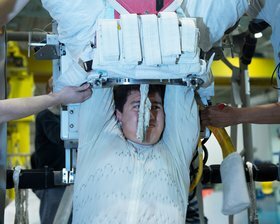 Most of the events that I participated in as a test subject required little more than a warm body inside the suit. And that was pretty much the only qualification I could offer. 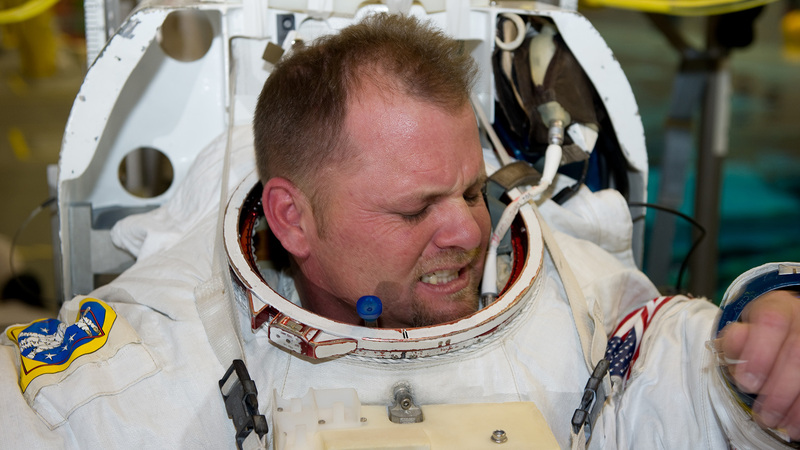 I eventually had opportunities to practice a handful of spacewalking skills and even became comfortable doing a few things, but it never affected the outcome of my events. Just being in the EMU was the point of the gig. Any astronaut-like skills I happened to pick up along the way were mere head-swelling gravy. Astronauts have much different demands in the EMU, so perhaps they view the equipment and the experience differently than I do. All I can say for certain is that in spite of the occasional sore muscle or bruised ego, my time in the EMU was a lark and among my favorite memories of participating in the space program.